Early medicine was scary to begin with, considering the lack of understanding the human body and the nature of illness. 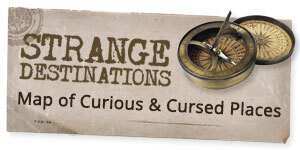 But let’s not forget the strange and terrifying old surgical tools and the lack of anesthetic. With names like the tonsil guillotine and the scarificator, surgery looked and sounded more like medieval torture. Elongated bullet extractors could reach bullets embedded deeply in the patient’s body. Extractors like this one had a screw tip that could be inserted in the wound and lengthened to pierce the bullet so that it could be pulled out. 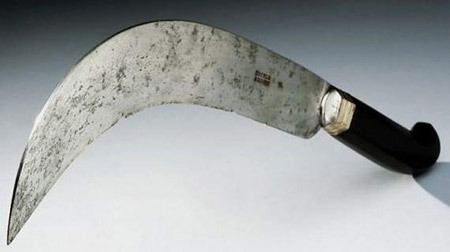 Knives used for amputations during the 18th century were typically curved, because surgeons tended to make a circular cut through the skin and muscle before the bone was cut with a saw. By the 1800s, straight knives became more popular because they made it easier to leave a flap of skin that could be used to cover the exposed stump. Bloodletting with leeches was such a popular treatment for a range of medical conditions that an artificial leech was invented in 1840 and was used frequently in eye and ear surgery. 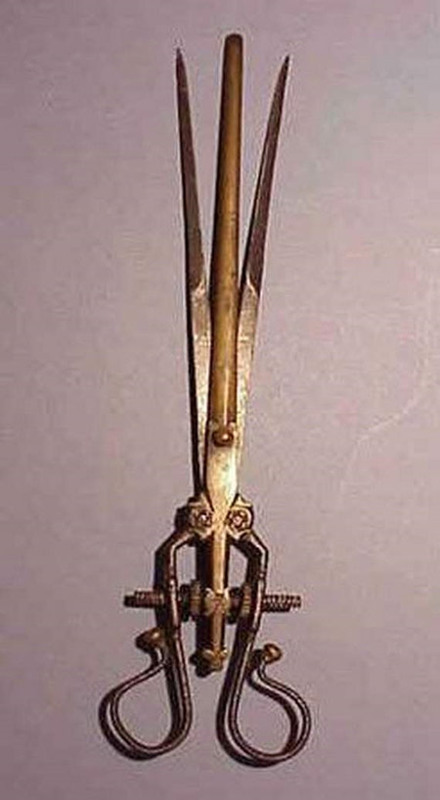 The rotating blades would cut a wound in the patient’s skin, while the cylinder would be used to produce a vacuum that sucked up the blood. 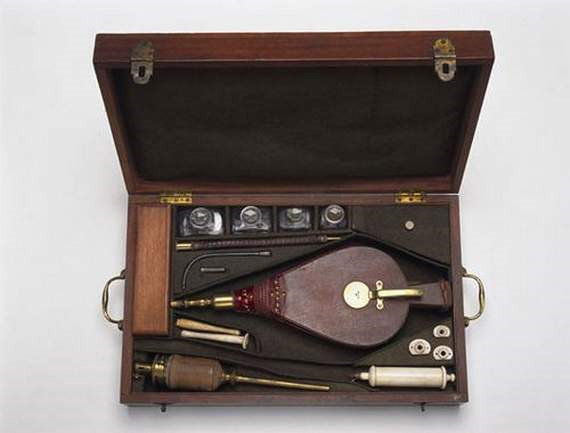 This instrument was used to dilate a woman’s cervix during labor, with the amount of dilation measured on the scale by the handle. Such dilators fell out of favor because they often caused the cervix to tear. This method of removing tonsils worked much like a traditional guillotine, slicing off the infected tonsils. 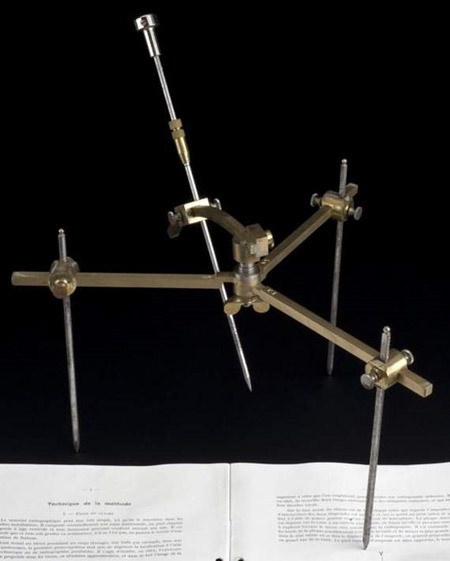 This “double guillotine” design meant that both tonsils could be removed at the same time. 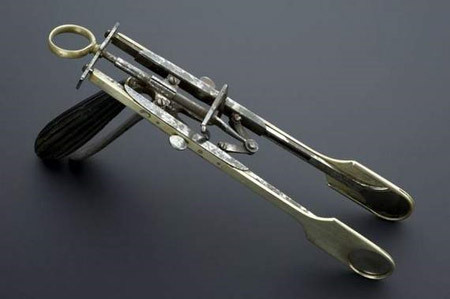 Tonsil guillotines were replaced by forceps and scalpels in the early 20th century due to the high rate of hemorrhaging and the imprecise nature of the device, which often left tonsil remnants in the mouth. 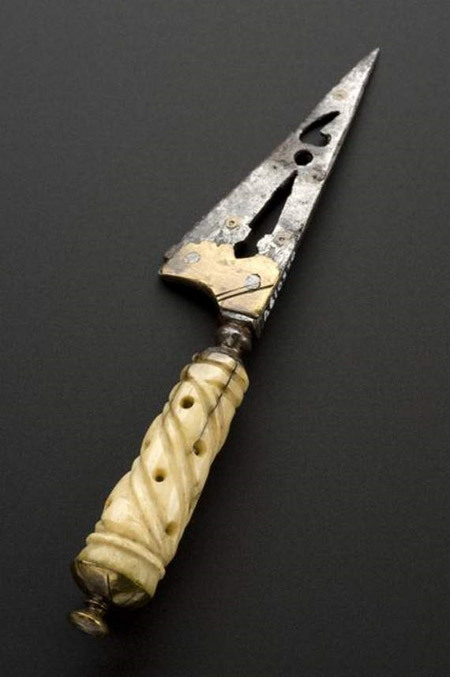 Ritual circumcision is performed around the world in varying extents and for varying reasons, but few instruments used in the process are as intimidating as this European knife from the 18th century. This lithotome was used to cut the bladder in order to remove stones. The shaft contained a hidden blade that was inserted into the bladder and then released using a spring handle. This hysterotome or metrotome was used to amputate the cervix during a hysterectomy. The Hirtz compass was used to accurately determine where bullets were located in the body so that they could then be removed with precision. Scarificators were used in bloodletting. The spring-loaded blades in this device would cut into the skin, and a special rounded glass cup could be applied over the wound. When warmed, it would help draw the blood out at a faster rate. 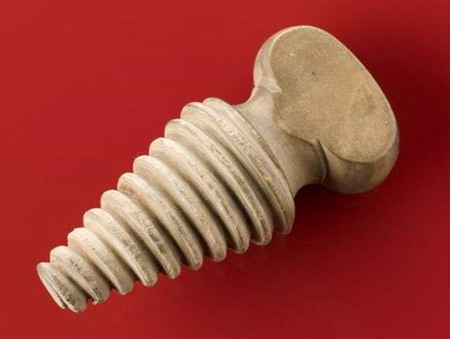 Specula have been used for thousands of years to allow doctors better vision and access to the vaginal area (or other body cavities) by expanding after insertion. This 17th century European example, which appears to use a cranking motion to expand, is more ornate and intimidating than most. 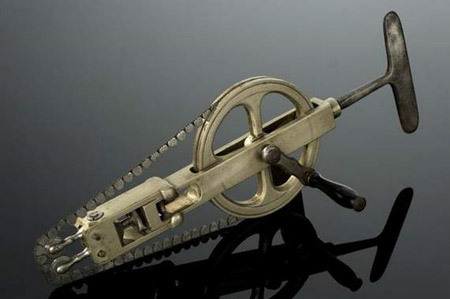 This trephine was a hand-powered drill with a cylindrical blade that was used to bore into the skull. The spike in the center was used to start the procedure and to hold the blade in place while cutting. 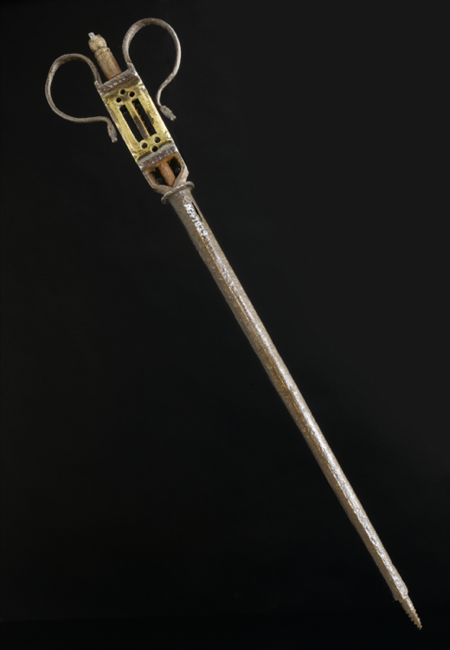 Not much is known about this tool, but it is hypothesized that it was inserted into the wound in a contracted position, with the central shaft used to grasp the arrow. The blades, which appear to have their sharp edges facing outward, were then expanded using the scissor-like handles, thus expanding the flesh around the arrow to prevent the arrowhead from ripping through the meat as it was pulled out. 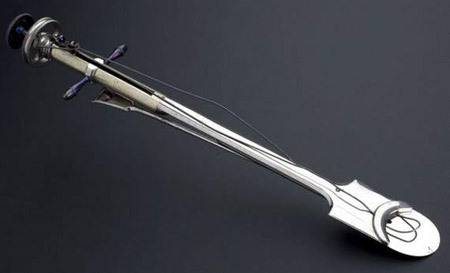 These forceps were used to grasp a hemorrhoid between the blades and apply pressure to stop the blood supply, causing the hemorrhoid to drop off. 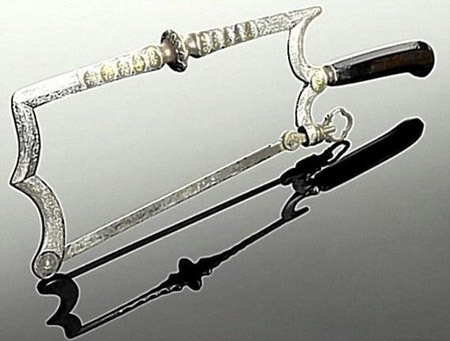 While some surgeons chose to flaunt their wealth with elaborately decorated saws like this, the crevices in the intricate engravings proved to be a breeding ground for germs. This wooden, screw-shaped mouth gag would be inserted into an anesthetized patient’s mouth to keep the airway open. 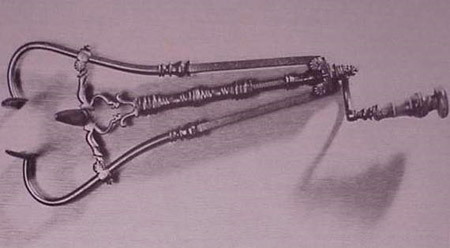 This hand-cranked saw’s blades were used to cut through sections of the skull, allowing for access by other instruments. 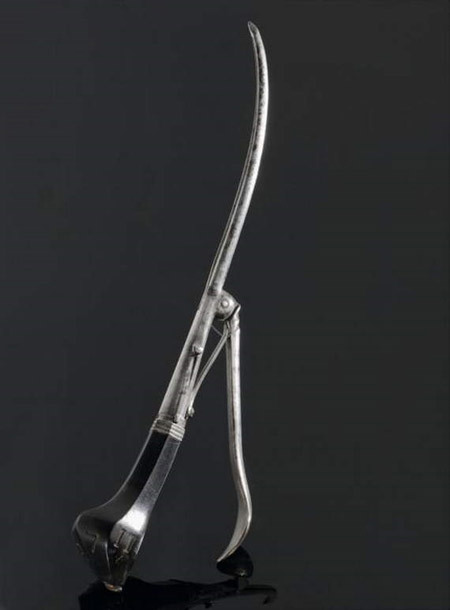 This unique tool was used after the restoration of a hernia. It was inserted into the body near the affected area and left there for a week to produce scar tissue that would help seal off the hernia. 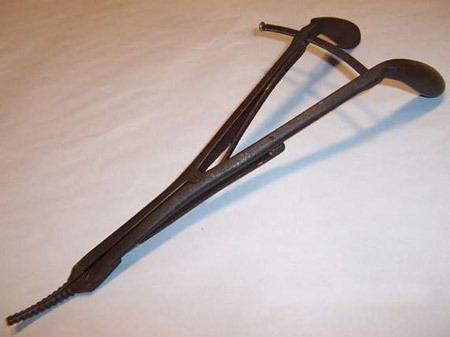 This ecraseur was used to sever hemorrhoids and uterine or ovarian tumors. The chain was looped over the mass and tightened using the ratchet, stopping the circulation of blood to the area. Jeeeeezzz! This surgery tools are so scary…… I like the new medical reformation. Gosh! are this tools real? In the past years, i have experienced a bone marrow surgery. I wouldn’t want to know the nature of tools the doctors used on me because i was deep gone in sleep. But seeing this article and the nature tools, if i’m asked to return for another surgery, heaven knows i won’t see the four walls of the theater. LOL. None of these devices, I don’t think, would have been so intimidating if anesthesia had been available and had been used because with anesthesia there would not have been any pain. But some of these devices were even before anesthesia was invented. Pingback: Click Social Shares » You’ll Cringe When You See What Doctors Used To Use On Their Patients. I’m surprised there was no instruments presented regarding teeth! That was dentistry and often done by an unqualifed man, often a Barber. Also Barbers were often Surgeons. The Red White Pole often seen outside a Barbers, was the sign of the Barber Surgeon. I can’t even stretch my hands very well because of how this makes me feel. What? Did they actually use those? They look like torture devices than surgical equipments. If people start using these they will be horrified..
Actually I have a new old stock from mid1800s &set of round cups.Bought them on ebay.Can’t wait to use them! I’m not lying it’s true ebay has lots of them .Apparently some Europeans use them with some great results.Supposed to be very helpful with inflammations especially that from arthritis.